Synopsis: Plasma-furnace technology was first applied in Africa in the mid- to late 1970s, when it was realised that advantages could be obtained in the processing of fines for the production of ferro-alloys. A number of processes have been investigated, and a 40 MVA DC transferred-arc ferrochromium furnace has been implemented on an industrial scale at Palmiet Ferrochrome, Krugersdorp. South Africa has well-developed plasma-furnace research facilities, which include the 3.2 MVA DC transferred-arc plasma furnace at Mintek, Randburg. This paper highlights some of the applications of plasma technology to a variety of ores, minerals, concentrates, metals, and chemicals. The development and successful implementation of plasma systems is described, as well as the problems that have been experienced with some of the less-successful activities. Interest in the application of plasma technology in Africa developed in the late 1970s, as a result of the perceived benefits of being able to process fines directly. Southern Africa has the world's largest reserves of several important minerals, including chromium, manganese, vanadium, and platinum ores, many of which are friable. During the mining of these ores, considerable amounts of fines are generated, and the beneficiation of lower-grade deposits invariably delivers a fine product as a result of comminution. In the South African context, the capability of the plasma furnace to accept fine feed materials without prior agglomeration is an attractive advantage. Materials such as ferrochromium and ferromanganese are conventionally produced in submerged-arc furnaces. These furnaces normally require a high proportion of lumpy feed materials to achieve good recoveries and to maintain a permeable burden that permits the escape of gases from the reaction zone beneath the electrodes. Furthermore, the electrical conductivity of the burden is largely dependent on the characteristics of the carbonaceous reducing agents (reductants) used for a given process. Variation in conductivity often limits the power level obtainable in such furnaces. Reductant quality is of great importance and therefore costly high-grade material is required. The possibility of plasma-arc technology being developed in such a way as to overcome the abovementioned deficiencies was therefore of some interest to the South African metallurgical industry, which experienced an era of rapid growth during the 1970s. The oil crisis and South Africa's relatively low-cost electricity (from coal-fired thermal power stations) were responsible for this growth. This growth encouraged Mintek to pursue the initial investigation of thermal plasma-arc technology, and to evaluate its potential benefits for the processing of minerals and ores in Southern Africa. Together with the high recoveries that are typical of plasma furnace operation, the direct processing of fines enables this type of furnace to compete favourably with submerged-arc furnaces, particularly in the production of ferro-alloys. Some unique advantages of plasma-arc furnace technology for industrial use include the following. Fine particle feed capability. The direct use of fine feed materials is possible, without the need for costly agglomeration. Plasma systems can operate with a wide range of gas flowrates allowing fine particles to be introduced into a flowing-stream reactor. Under low gas-flow conditions, fine particles can be bulk charged into a reactor with minimal entrainment and carry-over in the off-gas. Particles can be introduced through a hollow electrode for maximum exposure to the high-temperature arc environment. Independent energy source. The feed rate and power can be controlled independently. The electrical conductivity of the materials does not limit input of power. The power input to the furnace is largely unconstrained by the resistivity of the materials smelted or remelted. This allows greater freedom of choice with respect to charge composition, without having to consider the electrical characteristics of the charge. For example, low-grade coal can be used in place of more expensive anthracite. High temperatures. The usual gas temperature range of 3000 to 6000°C (even up to 10 000°C) and the gas enthalpies for plasma systems can be significantly higher than those where combustion is the energy source (up to 4000°C). High energy fluxes. 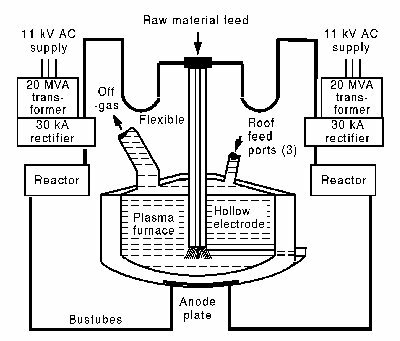 High energy fluxes are a result of the higher temperatures, high jet velocities, and higher thermal conductivities of plasma gases that permit the design of reactors with high reaction volume intensities. For transferred arcs, there is an additional energy flux from the electron transfer at the anode arc root-attachment area. High energy flux allows high smelting capacity with smaller furnace dimensions. High throughput. There is considerable scope for the achievement of high throughputs in open-bath processes, because of the higher reaction rates attained by the use of finer feed particles. Gas flowrate control. The gas mass flowrate and temperature can be controlled independently of the energy input, by proper selection of the plasma system. In combustion systems, the gas flowrate, temperature, and energy input are interdependent. Electrical energy intensive. Where hydro-electric or nuclear power is available, decreased dependence on fossil fuels is possible, particularly for off-peak and off-season usage. Rapid response. The furnace can respond to changes in a relatively short period. Low electrode consumption. The pre-baked graphite electrodes used in DC transferred-arc furnaces are consumed more slowly than the self-baking Söderberg electrodes usually used in AC furnaces, resulting in a higher degree of purity of the melt. Electrode consumption (expressed in kg per MWh) is lower, but the electrodes are usually of higher quality, and are therefore more expensive. The lower electrode consumption is due partly to the lower electrode surface area (one electrode instead of the three usually used), and partly to the lower tip-erosion encountered. Control of refractory consumption. Maximum throughput and furnace efficiency would be attained if a liquid slag layer were maintained right up to the side-walls. This would be expected to result in high refractory costs due to slag erosion of the side-wall refractories. A controlled 'freeze lining' of minimum thickness would be the ideal solution to these conflicting requirements, which requires a high degree of control (which is provided by plasma furnace technology). Low noise level. Electrical and acoustic noise levels are reduced significantly in processes such as steel scrap remelting. DC transferred-arc plasma technology is widely preferred for metallurgical processing for the following reasons. The electrical supply characteristics and geometric arrangement of the transferred-arc furnace are similar to those of conventional submerged-arc furnaces, and the change to DC operation is relatively straightforward. Scale-up to industrial operation, when a graphite electrode is used, is now feasible. The use of an open bath of liquid slag and metal (the anode) permits greater control of the process metallurgy than with a choke-fed furnace. Transferred-arc devices have low cooling-water losses (usually less than 10 per cent). The most important feature of DC operation is the ability to sustain longer, more stable arcs than AC operation, with independent current and voltage control. As a result, a significant reduction of electrode consumption, electrical disturbances, and noise can be obtained. iii) little of the sensible energy of the gases evolved is utilized in preheating the feed materials. The open-bath system provides opportunities for excellent process and product control, but is limited by the loss of volatile materials to the off-gases and by the relatively high losses of power to the roof (50 to 150 kW/m²). High throughput rates are therefore necessary to offset the various mechanisms of energy loss. Industrial-scale implementation of DC plasma-arc technology followed rapidly on the demonstration-scale testwork carried out at Mintek. The first two applications were for ferrochromium smelting and remelting of metal fines, and ferromanganese fines melting. Applications in Africa to other ores, minerals, concentrates, metals, and chemicals, have been investigated by various organizations. This paper highlights some of these activities, and explains the development of the successfully implemented plasma technologies, as well as the problems experienced with some of the less successful ones. Mintek has been involved in research and development work on the application of thermal plasma to process metallurgy since 1976 . In 1979, the DC transferred-arc plasma furnace was identified as probably the most promising approach to the processing of ore fines, and testwork was started on a pilot-plant facility based overseas, as no equipment was available in Africa at that stage. The DC precessive water-cooled metallic plasma-arc torch in an open-bath furnace configuration, at Tetronics Research and Development Limited in Faringdon, England, was used. A series of trials (using 300 kVA and 1.4 MVA transferred-arc furnaces) was carried out for Middelburg Steel and Alloys, who wanted to utilize a plasma arc for the smelting of high-carbon ferrochromium from Transvaal chromite fines and fine, low-cost carbonaceous reducing agents, as well as for the remelting of ferrochromium fines. The work was successfully piloted at about the 0.4 MW level. However, since the water-cooled plasma torches of that time had limited potential for scale-up, graphite cathodes were used in the pilot-plant facilities that Mintek subsequently established in the early 1980s. The first 100 kVA (three-phase AC non-transferred-arc) furnace at Mintek was based on the extended-arc flash reactor developed at Toronto University. This configuration, with three hollow consumable graphite electrodes inclined at 45 degrees from the vertical, was not felt to be suitable for scale-up to industrial size, so work began on a DC transferred-arc furnace with a single electrode. 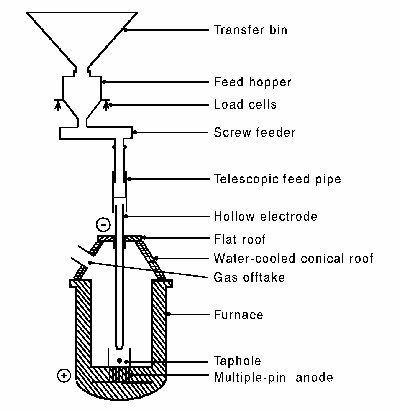 The hollow graphite electrode, through which the ionizing gas (and feed if desired) can be passed, was mounted vertically in the centre of the furnace. The large-scale 3.2 MVA facility (installed and commissioned during 1984) is capable of sustained operation at power levels greater than 1 MW. During 1988, the facility underwent a major reconfiguration. The new furnace is depicted in Figure 1. The domed brick roof was replaced by a water-cooled conical roof, and the three anode bars embedded in the hearth were replaced by a multiple-pin anode. A six-component feed system with improved sealing and gas tightness, capable of handling dry materials ranging from 100 µm to 12 mm, was introduced. As a result, a wider range of metallurgical processes could be evaluated, since a large number of components could be fed simultaneously to the furnace. The versatile feed system could also distribute the feed either around the 125 mm graphite cathode or through a 75 mm hole down its centre (to introduce the feed directly into the high-temperature bath area) at a typical feed rate of 1 t of total feed per hour, but up to 2 t/h can be used. Although the outer diameter of the furnace shells was reduced, decreasing the mass and the cost of furnace relining, there was no reduction in the attainable power levels or feed rates. Mintek's pyrometallurgical pilot-plant facilities include 50 kW, 100 kVA (70 kW), 200 kW, and 3.2 MVA (1.0 MW) DC plasma-arc furnaces. These facilities are used for experimental campaigns on a wide range of materials. The 200 kW system is capable of having dry materials ranging from 100 µm to 6 mm fed down the centre of the cathode, around it, or both. The pilot-plant bay at Mintek has well-developed capabilities for gas handling, and feed systems that include vibratory feeders. Hollow graphite electrodes are usually used as cathodes, but water-cooled electrodes have also been used when required. Graphite electrodes are preferred for most purposes as they impose no limits on current (up to say 100 kA), are simpler (requiring less skilled maintenance), and introduce no source of water into the furnace (also saving on the costs of a water-cooling circuit). In a comparison (Stenkvist) between DC arc, AC arc, and DC plasma-gun arc, the graphite-cathode DC arc provides the most efficient energy transfer, with the largest portion of the arc power being transferred directly to the melt. This high efficiency is due to the fact that a strong, electromagnetically pumped plasma jet convects most of the power toward the anode. The DC arc, with stable unidirectional convection, is superior to the AC arc in transferring its energy directly to the anode in a metallurgical process. The consumable graphite electrode is able to operate without water cooling at far higher current and power levels than a plasma torch with water-cooled metal electrodes. Thus the combination of DC power and graphite electrode provides greater and more flexible opportunities for commercial metallurgical processes. The disadvantages of DC, compared to AC, involve the necessity for an electrical connection to the liquid metal anode (not necessary in the conventional three-phase AC system), and the extra cost and space required for rectification. The major factor affecting electrode erosion is the arc current. Consequently, for a particular power requirement, any decrease in the current arising from an increase in the voltage implies a decrease in electrode consumption. At high currents, say over 100 kA, the electrode erosion rate is lower for graphite than it is for its major competitor (in transferred-arc devices), thoriated tungsten. This is of particular importance in energy-intensive smelting processes where the electrode costs per ton of alloy produced are higher than, for example, those for scrap remelting. However, the improvements in arc stability have usually been accompanied by additional costs such as inert-gas injection, water-cooling of the plasma device, or rectification of the power supply. Recent plasma-furnace work at Mintek has involved high-intensity smelting [3,4], the high-temperature reactions in the arc-attachment zone , and the application of large-scale plasma systems. [6,7] Apart from the applications detailed in this paper (iron and steel, ferro-alloys, and light and refractory metals), Mintek has undertaken work on the production of other chromium-containing products such as Cr7C3, the production of pure chromium via the aluminothermic reduction of Cr2O3, and the production of zirconium compounds (Zr, ZrAl3, and partially-stabilized ZrO2 from ZrSiO4). Pilot-scale work has been done at Mintek on the recovery of copper, nickel, and cobalt from converter slags. Other applications include the production of ferroniobium, catalyst regeneration, the fuming of lead and zinc from lead blast-furnace slags, and the treatment of low-carbon ferrochromium slags (which have high concentrations of Cr6+). The Atomic Energy Corporation of South Africa Ltd (AEC) has been involved in the development of plasma facilities since about 1987. The Plasma Technology Department has carried out work in a number of fields. DC plasma reduction of uranium hexafluoride (UF6) to uranium tetrafluoride (UF4) with hydrogen or cracked ammonia has been tested. It was shown that the plasma process can be scaled up to a production rate of 1 kg of UF4 per hour, with the possibility of better economy and safety, as well as the advantages of intermittent operation. It is conservatively estimated that the plasma process could introduce a saving of about one third of the cost of the conventional process (which uses the enthalpy of reaction between the fluorine and the hydrogen). The plasma process is also safer. Altogether, just over 13 kg of depleted uranium metal (meeting all specifications) has been manufactured from the UF4 product from the plasma process. A high-frequency plasma process was utilized to effect in situ fluorination of precipitated beta-UF5, using fluorine (diluted with argon) or CF4 as fluorinating agents. The CF4, in turn, could possibly be produced economically in a thermal plasma reactor. This method was seen as a possible economic replacement for the existing processes, for example those utilizing ClF3 or a mixture of F2 and BrF5. Uranium metal was controllably fluorinated (in cold- and hot-plasma systems) using CF4 or diluted (10 per cent) fluorine in argon. This process can be carried out regardless of whether the metal is heated or not. (It must be pointed out that the work was done with low flowrates of fluorinating agents, and at higher flowrates the possibility of runaway reactions with hot metal cannot be ruled out.) Dilution of the fluorine with an inert gas is required to render the process controllable. As expected, the rate of mass loss during fluorination with CF4 was lower than that with fluorine. This is probably because only one fluorine radical forms per molecule of CF4, resulting in a lower concentration of fluorine. It was found that plasma-fluorination of uranium with fluorine holds no advantages over direct fluorination, because the reaction rate depends primarily on the concentration of fluorine and the total exposed surface area, and only secondarily on the temperature of the metal. CF4 is a safer reagent than fluorine, but would have to be made much more cheaply (e.g. directly from CaF2 and carbon) than fluorine to have any significant advantage over the use of fluorine. Work on the plasma treatment of inexpensive and readily-available coal fines to produce acetylene, ethylene, and other gases was carried out with a view towards possible commercialisation, but primarily to gain experience with solids feeding, which could be used in the processing of uranium-containing powders. This work was subsequently terminated. In 1982, Mintek assisted the AEC to develop a plasma-arc process for the aluminothermic reduction of high-purity zirconium oxide (upgraded baddeleyite) to produce ZrAl3. The ZrAl3 was processed in an electron-beam furnace to evaporate the aluminium and produce zirconium metal. Unfortunately, the metal quality did not quite meet the standards required for nuclear-grade metal. Zirconium metal, having the properties of good corrosion resistance at high temperatures, good mechanical strength, and low neutron cross-section, is required for use both in the nuclear and the chemical industries. A process has been developed at the AEC , in which ZrCl4 vapour is reduced with hydrogen to produce metallic zirconium. A hybrid DC transferred-arc plasma reactor was designed and constructed, in which the required temperatures (between 3000 and 3500 K) and reagent ratios (H2:ZrCl4 = 32) could be maintained in a stable plasma column. An argon plasma at a pressure of 40 kPa (absolute) is ignited between a thoriated tungsten cathode and a cylindrical water-cooled copper cathode. (Graphite electrodes are not used, because graphite sublimates readily at temperatures above 4000 K, and nuclear-grade zirconium requires a carbon content of less than 0.008 per cent by mass.) Regulation of the temperature of a secondary zircalloy-disc anode, by controlling the supply of cooling water, makes it possible to collect the product either as a powder or in a molten metal bath. A maximum yield of 65 to 68 per cent of the zirconium was collected, as opposed to the thermodynamically possible 95 per cent. It is suspected that some of the molten metal was re-chlorinated. A 96 kW plasma furnace was obtained in 1992. This is to be used for various research projects (i.e. gas heating, waste destruction, and special melting). 200 kg/h capacity, graphite-lined, up to 1600°C. The furnaces have data-logging capabilities, but are controlled manually. Ancillary equipment includes screw and vibratory feeders, and dust-extraction equipment. Plasma development at Anglovaal started in early 1984 with work on the recovery of iron and sulphur compounds by pyrolysis of pyrite and pyrrhotite ores from Prieska. The plasma facilities have been utilized successfully for work on gold recovery from Eastern Transvaal refractory ores, platinum-group metal (PGM) recovery from chromite-containing ores, high-temperature recovery of refractory metals (including tantalum, niobium, molybdenum, and tungsten), and the production of fused refractories from andalusite. The production of iron and steel is currently dominated by the blast furnace -- basic oxygen converter route. However, plasma-based processes still have a role to play in the production of iron. For example, electrically generated thermal energy is used for the melting of steel scrap in open-arc electric furnaces. Direct reduction of iron ore in the form of lumpy material or of fines agglomerated as pellets can be carried out in a vertical shaft furnace or a rotary kiln. Most direct-reduced iron (DRI) is produced in shaft furnaces, where the ore contacts the reducing gas in countercurrent flow in moving or stationary beds. Gaseous reducing agents, namely carbon monoxide and hydrogen, are introduced to the base of the shaft furnace at elevated temperatures of up to 1000°C. The reducing gas is most commonly produced by the reforming of natural gas, which consists mostly of methane (CH4), in a catalytic reformer vessel. The endothermic reforming reactions are supported by heating of the reformer vessel by a heat-exchanger in which some of the natural gas is combusted to provide the energy source. A recently-developed alternative to this reforming method uses thermal plasma to heat the gases directly in the reaction vessel. The introduction of plasma energy into a gasification system permits operation independent of oxygen potential, and provides efficient energy transfer to the gasifying medium. Thus the combustion of natural gas to heat the reformer indirectly can be replaced effectively with direct plasma heating inside the vessel, i.e. electrical energy. However, the plasma device is not directly coupled to the shaft furnace, and hence the plasma is interfaced only indirectly with the process itself. The Union Steel Corporation of South Africa (USCO) installed a direct-reduction process [11,12] based on the reforming of a synthetic gas (produced by the gasification of bituminous coal, as practised by SASOL in South Africa) in 1985, with a view to using alternative reforming agents like coal fines at a later stage. The USCO plant was designed to produce 300 kt of DRI per annum. In each of the three reformer vessels, the energy for the reforming process is provided by an 8 MW arc-heater device. The arc-heater devices were developed by Chemische Werke Hüls AG, of Marl, Germany. In the USCO-Hüls process, steam is introduced into the reforming vessel to improve the ratio of hydrogen to carbon monoxide. The process off-gas is not recycled back to the reformer vessel but is blended after removal of the water and carbon dioxide with the superhot stream of gas produced in the reformer vessel by the interaction between the high-temperature plasma tail flame, the syngas, and the steam. The plasma unit attained a chemical efficiency of up to 95 per cent in the conversion of methane to synthesis gas, and was able to achieve H2 to CO ratios from 1:1 to 1:3. Unfortunately, problems were experienced in the shaft furnace, with the lock-hopper valve systems leaking and sticking (because they could not withstand the variations in temperature and pressure). The plant was mothballed by USCO in 1987, as a result of economic factors (high electricity cost, high cost of transporting ore from Phalaborwa, and the low price of scrap in 1986). Iscor bought USCO's steel division in mid-1991, and USCO closed down the sponge-iron and vanadium plants, leaving only the non-ferrous activities intact. DRI and iron ore have been co-melted/smelted to make steel in the pilot-scale furnaces at Mintek. Low-carbon steels have been produced directly in this manner. The DC arc furnace has been shown to be very suitable for continuous melting of DRI metallized to 87 to 92 per cent. Power levels of close to 400 kW have been achieved in a furnace with a diameter of 0.44 m, so that, at the feed rate of 0.5 t/h, the furnace was tapped every 10 to 15 minutes. A power flux of over 2 MW/m² of hearth area has thus been achieved, with an electrical-to-thermal efficiency for melting of DRI of more than 80 per cent, even at this relatively small scale, since the energy loss of about 50 kW remained virtually constant with increasing power level. This confirmed that the energy transfer to the DRI was not rate-limiting as far as melting is concerned, even up to such high values of power flux. DRI fines have been melted, with a recovery of iron to the steel product of about 90 per cent. The carbon level in the metal could be readily controlled between 0.1 and 2 per cent by adding a suitable quantity of carbonaceous reducing agent (e.g. coal fines) with the DRI. Iscor's plant at Vanderbijlpark, South Africa, is successfully melting DRI in an open-bath operation in conventional ultra-high power (UHP) furnaces using a foaming slag to limit arc flare. A recent growth area for the application of plasma technology has been the development of processes for the recovery and recycling of metals from industrial residues and wastes. Plasma processing is particularly well suited to the treatment of wastes, due to its capability of high-temperature chemical processing and handling of fines, and because electricity is a relatively clean source of energy with minimal environmental impact at the process site. The economic potential is particularly attractive for the disposal of hazardous materials as determined by the environmental economics, and not by the value of the useful products. During steelmaking in an electric-arc furnace (EAF), 10 to 15 kg of dust, consisting of various metal oxides, is generated per ton of steel product. In many countries, the disposal of EAF dust in landfill sites is regarded as an environmental hazard, since toxic metals may be leached into drinking water supplies. In the USA, EAF dust is classified as a hazardous waste, and regulations require it to be treated chemically or thermally to remove or stabilize the leachable toxic metals. Steel-plant dusts can be grouped into four broad categories. They may be grouped according to their content of alloying elements (especially Ni, Cr, Mo, and Mn) as carbon-steel or alloy-steel dusts, and as either low- (< 15 per cent) or high-zinc dusts. Low-zinc carbon-steel dusts represent the least valuable category, and their treatment is generally dictated by environmental rather than economic considerations. Cheaper chemical or recycling routes may be sufficient for their treatment. However, alloy-steel dusts (even those low in zinc) require fairly strong reducing conditions to lower the chromium in the slag phase to acceptable levels, thus rendering them suitable for disposal. The other three dust categories are therefore potential candidates for treatment via electrically-based thermal routes. the potential to strip the slag phase of oxides of chromium and other alloying elements, resulting in the generation of an innocuous disposable slag, and in the case of alloy-steel dusts, in the concomitant generation of a valuable alloyed metal. The Enviroplas process (Dust), currently under development at Mintek, is a DC plasma-arc process that can treat EAF dust, alloy-steel dust, or a mixture of both. The dust is fed to the furnace directly down a hollow graphite electrode. The process is based on the reduction of selected metal oxides at high temperatures by means of a carbonaceous reducing agent, with the production of an innocuous slag. In the case of EAF dust, lead and zinc oxides are reduced to their respective metals, volatilized, and then either re-oxidized to a mixed oxide or condensed as metals. At present, fume is combusted to ZnO and collected in a bag filter. In the case of alloy-steel dust, a ferro-alloy rich in chromium and nickel is tapped. From 1989 to date, about 100 t of lead blast-furnace slags and steel-plant dusts have been processed at various pilot scales up to 1 MW, and the process is at present being further developed to recover metallic zinc directly in a lead splash condenser. A proposed 3 MW unit could process around 18 kt of EAF dust per annum, or 10 kt of alloy-steel dust. It appears that the proposed units could be operated profitably, even before the avoided costs of disposal are taken into account. The disposal problem should be solved at its primary source. This is compatible with operation on a contracted-out basis. On-site treatment minimizes potential environmental legal liabilities, and minimizes or eliminates road transport (and the associated cost and taxes). The waste-management installation could be wholly operated by a contractor. In this way, the system can be run with no capital costs to the client, with a charge being made purely for services. This requires no responsibility on the part of the steelmaker for the supervision of operating personnel, or for the maintenance of the equipment. The development of submerged-arc furnaces appears to have reached a plateau where relatively little further progress can be made in their design and operation. Ferrochromium smelting (in submerged-arc furnaces) is still constrained by relatively low power densities (less than 0.5 MW/m²), and high losses of unreduced chromium ore in the slag are typical. Submerged-arc ferromanganese smelting is characterized by relatively high losses of manganese oxide to the slag (typically 20 per cent by mass) and low-resistance operation that gives rise to poor power factors, i.e. low megawatts given high MVA values. The electrical resistance in these processes is determined largely by the raw materials used, and this interrelation can have an adverse affect on the stability of the operation, particularly at high power levels. Both of these processes therefore depend on carefully selected raw materials; direct control of the operations is difficult owing to their very long time constants (days). On the positive side, these furnaces have a fairly high electrical-to-thermal efficiency, typically 85 to 90 per cent, and they require rebuilding only after several years of operation. Furthermore, the chemistry of the processes, although somewhat constrained, is virtually self-regulating, and only limited amounts of high-temperature volatile species are lost to the off-gases. South Africa has very large reserves of three of the most important oxide ores, namely iron ore, chromium ore, and manganese ore. In addition, it has reasonably abundant resources of carbonaceous reducing agents in the form of bituminous coals, and relatively low-cost electrical power. As a result, up to 50 per cent of the ores mined are converted locally to the metallic form. Conventional methods for the processing of these materials generally require lumpy sized material, whereas fairly large quantities of fines are produced during mining activities. Although agglomeration techniques are well established, they are costly, and therefore a strong motive exists for processes to be developed that use fine feed materials directly, and which are flexible with respect to the choice of the raw materials and the energy source. Furthermore, the preheating of fine materials in, for example, a fluidized-bed reactor, as a means for the saving of electrical energy, is potentially a very cost-effective method whereby operating costs can be lowered with a relatively small additional capital expenditure. Among the first metallurgical processing tests conducted at Mintek using plasma technology was the remelting of alloy and metal fines arising from the crushing, screening and recovery operations associated with conventional ferro-alloy processing technology. These fines, which are often contaminated with slag, are of relatively low value, and can pose problems when fed back to conventional submerged-arc furnaces. It was not only demonstrated that ferrochromium fines could readily be remelted, but also that partial refining could be achieved. For example, in tests using 100 parts of ferrochromium fines, 28.6 of fine chromite, and 4.3 parts of quartz, the silicon content was lowered from 3 to as little as 0.11 per cent, and the carbon from 6.6 to 4 per cent. Ferromanganese fines were also successfully remelted, and it was found that carbon and silicon levels were lowered by the remelting process. Due to the abundant chromite fines available in South Africa at lower costs, it made economic sense to investigate a metallurgical process whereby fines could be directly converted to chromium alloys without first having to be agglomerated. This is a costly and sometimes not entirely effective process. Although nowadays a significant fraction of fines can be fed to submerged-arc furnaces, the chromium recovery suffers greatly as a result. Following a joint development by Mintek, Middelburg Steel and Alloys, and ASEA of Sweden, a 16 MVA (14 MW) DC transferred-arc furnace was installed at Krugersdorp, and commissioned in December 1983. This demonstration-scale prototype furnace replaced an existing 9 MW submerged-arc furnace. The furnace shell was 7.5 m in diameter and 2.4 m in height, with side-walls lined with magnesia bricks and an outer roof of water-cooled refractory-lined panels. The single central hollow graphite electrode was 560 mm in diameter. Nitrogen was passed down the central hole to maintain the stability of the plasma. Startup and commissioning took place during 1984 and 1985, and satisfactory operation was achieved in 1986. During the six years following installation, the furnace was developed further into a successful production unit, reaching its fully-installed power level. The furnace was totally closed, and the feed could enter through the hollow electrode or through three gas-tight ports in the furnace roof. Dried chromite fines were batched in various proportions with fluxes and reductants according to the set recipe required for the grade of chromium alloy to be produced, and stored in primary bins above the furnace, from which vibrating feeders supplied the four feed ports. The initial feed for the plasma furnace was a blend of coke and chromium ore fines, plus recycle charge-chrome fines that constituted from 10 to 50 per cent of the total feed. The chromium recovery exceeded 90 per cent, which was greater than that achieved in conventional smelting furnaces. A major advantage of the plasma design is the closed-top furnace, which can allow the recovery of the sensible and combustion energy of the hot carbon monoxide off-gas for preheating of the feed. Table 1 compares the production of ferrochromium in the plasma-arc furnace with that by conventional submerged-arc smelting. It is evident that the chromium content of the alloys was similar, but that the recovery of chromium was improved significantly by use of the plasma-arc process. The sulphur and phosphorus contents of the alloy produced in the plasma furnace are less than half those given in the standard specification. By 1987, the process and the furnace were performing well, and during 1988 the average power level achieved was 12 MW; the maximum level obtainable with the 16 MVA power supply was 14 MW. The production of ferrochromium was 18 kt/a. Towards the end of 1987, MS&A decided to uprate the furnace to 40 MVA, so that the production of ferrochromium could be increased. Other considerations included the anticipated improved thermal efficiency of a larger furnace, together with the demonstrated advantages with regard to the cost of raw materials. The 40 MVA furnace was installed at the end of 1988, and the relative simplicity of the design contributed to the relatively low cost of the conversion. A conductive hearth and bottom electrode developed by ASEA  are used in the furnace. The furnace shell is 9 m in diameter and 3.8 m high. Power was switched on to the furnace on 13 December 1988, and it was planned that full power would be reached early in 1990. An electric current of up to 60 kA is used. The 40 MVA (32 MW) furnace at Palmiet Ferrochrome (previously known as the Krugersdorp plant of Middelburg Steel and Alloys, and now a division of Samancor Ltd), depicted in Figure 2, succeeds the previous unit as still the only open-bath DC transferred-arc furnace world-wide for producing ferrochromium alloys. The fully computerized furnace, which was designed and manufactured in South Africa, is supported by state-of-the-art ancillary plant and equipment, all designed locally. The furnace can be closed more easily because of its single-electrode operation and simpler feed distribution, and can therefore make use of the excess thermal energy in the furnace off-gases for pre-heating or pre-reduction of the incoming charge. The furnace responds rapidly to changes in operating conditions or charge inputs, because smelting is carried out under open-bath conditions. The rapid response time and greater flexibility in the process, make it possible for a plasma furnace to produce a wider range of alloy compositions than can be produced in a submerged-arc furnace. the possibility that the metallurgical smelting process could be modified as a result of the above points, to permit greater flexibility in the specification of the product, e.g. carbon, silicon, chromium, sulphur, and phosphorus contents. Despite these anticipated advantages, it was recognized that the consumption of electrical energy was likely to be the same as that in conventional submerged-arc furnaces, and possibly even greater. Ferromanganese fines have been remelted in the 100 kVA pilot-scale furnace at Mintek, and at the 4 MW level in the 10.8 MVA Freital / Voest-Alpine furnace at Samancor's Metalloys plant in Meyerton, South Africa (which started up in 1983). Ore reduction has been carried out at the 100 kVA pilot scale at Mintek, for the production of ferromanganese-silicon (FeMnSi) and high-carbon ferromanganese (HCFeMn). In the case of HCFeMn production, high manganese losses were experienced because of evaporation. Samancor's 10.8 MVA furnace was also used to produce FeMnSi and HCFeMn. The Samancor furnace, which has a single water-cooled plasmatron (transferred-arc device), was designed primarily to melt ferromanganese metal fines. The rating of the thyristor-controlled power supply is 10.8 MVA, and the plasma device itself is capable of operation up to 9 kA and 800 V, although voltages above 200 to 300 V are not easily attainable in practice. Power levels of only some 2 to 4 MW are therefore obtainable unless higher voltages can be reached. However, it was found that higher voltages caused stray arcing into the water-cooled parts of the roof, and even into the off-gas duct. At these power levels, the electrical-to-thermal efficiency would be expected to be fairly low. The design capacity is 50 kt/a for fines remelting, although this level has never been reached. Mintek has also carried out a considerable amount of work on the melting and smelting of ferromanganese alloys in open-bath transferred-arc systems. If the power density for melting is matched to the furnace size, then efficient operation with good recoveries can be achieved. However, smelting results in excessive losses of manganese vapour, and a shaft-furnace approach would appear to be a more suitable configuration. Open-bath furnaces have the disadvantage that the off-gas exits directly from the system, resulting in high energy losses, and the loss of approximately 10 per cent of the manganese through evaporation. This is caused by the high vapour pressure of manganese at temperatures around 1700 to 1900°C. Consequently, the manganese yield of such systems is only approximately 50 to 60 per cent, and the manganese content in the metal is limited to between 72 and 77 per cent. The energy consumption of such processes is between 3.8 and 4.5 MWh/t of ferromanganese. These tests were carried out in a cylindrical 5 t plasma furnace with a central 3 - 5 MW plasma torch at Voest-Alpine Industrieanlagenbau and Samancor. 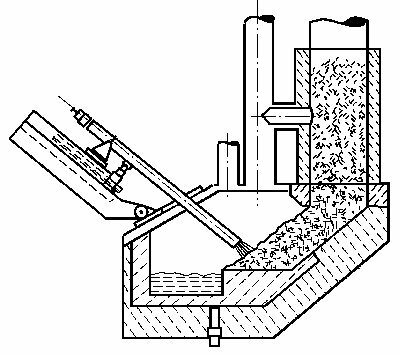 The high manganese loss, as well as the high energy demand, gave rise to the development of the so-called boot furnace , depicted in Figure 3. This furnace (which uses the power supply of the furnace previously mentioned) combines the features of an open-bath and a shaft furnace. The main feature is that the manganese evaporated in the plasma zone is condensed in the burden, and the thermal energy of the off-gas is used for preheating and partial prereduction of the material -- as in the submerged-arc furnace. The manganese loss by evaporation is intended to be reduced to approximately 3 per cent, and the manganese yield increased to approximately 84 per cent. The manganese content of ferromanganese should be within a range of 76 to 78 per cent, and the energy consumption should be approximately 3 MWh/t. At a furnace power of 2.5 MW, this corresponds to a production rate of approximately 0.8 t of ferromanganese per hour. Compared to the conventional submerged-arc furnace process for ferromanganese production, the advantage of the boot furnace design is that fines can also be used as input material. Of considerable importance is the fact that the unit described can also be operated with oxygen plasma torches for refining. Investigations are currently being made into the smelting of low-carbon ferromanganese in one process step. Promising tests have already been carried out in the 5 t plasma furnace of Voest-Alpine Industrieanlagenbau, and the 'boot furnace' at Metalloys is currently undergoing commissioning. Melting of ferrosilicon and silicon metal fines has been carried out at pilot scale at Mintek. The carbothermic reduction of silica to produce silicon in an open-bath transferred-arc plasma furnace results in high losses of silicon monoxide, and therefore a shaft-furnace process is preferred. However, success was achieved in the co-melting of silicon fines (in the form of an off-grade product from the production of silicon) and reject high-carbon ferromanganese or high-carbon ferrochromium fines to produce a wide range of medium- to low-carbon silicide alloys. Compositions of standard and, in some instances, even better, specifications have been produced. During the co-melting and subsequent cooling processes, the carbon from the high-carbon alloys is exsolved as a result of its very limited solubility in high-silicon alloys. Most of these co-melting tests were carried out in Mintek's 100 kVA transferred-arc plasma batch furnace. Silicon fines were remelted successfully, and good recoveries of upgraded silicon were obtained. Ferrovanadium is conventionally produced by the aluminothermic reduction of vanadium pentoxide in the presence of metallic iron. This process is highly exothermic when practised on a large scale, but small-scale work requires the addition of electrical energy to offset the losses of energy. Small-scale production of ferrovanadium (to the ISO specification for FeV80), using aluminothermic reduction of V2O5, has been carried out. A process was conceptualized at Mintek for the carbothermic reduction of V2O5 to produce a vanadium sub-oxide (approximately VO), which is then reduced further using aluminium, with the iron being added as metal. The plasma furnace would be well suited to supplying the energy requirements of this endothermic process. Preliminary testwork to demonstrate the validity of this concept was undertaken on Mintek's 100 kVA plasma furnace at a power level of about 30 kW. The initial results were reasonably encouraging, with an alloy containing 85% V being produced, although the carbon content of the final alloy was too high. Attempts were made to produce ferrotitanium (containing 70% Ti) from high-titania slag, via aluminothermic reduction in Mintek's 200 kW DC transferred-arc plasma furnace. This grade is usually produced by the co-melting of titanium scrap with iron. Unfortunately, the alloy produced contained only 56 per cent titanium, and had a titanium-to-aluminium mass ratio of only four. Further tests in a specially designed 30 kW furnace from which air could effectively be excluded, managed to reduce the nitrogen content of the alloy, but were not able to sufficiently lower the oxygen content. It was concluded that the desired alloy could not be produced in a single stage using this type of process. Magnesium has been produced at Mintek  by a modified version of the industrial Magnetherm process, a plasma-arc system being used instead of the submerged-electrode furnace normally employed, and the reaction being carried out at atmospheric pressure instead of under vacuum. Both 50 and 100 kVA DC transferred-arc furnaces, each with a single graphite electrode, were used in the tests. The raw materials constituting the charge were burnt dolomite (77 per cent), ferrosilicon (13 per cent), and alumina (10 per cent). The magnesium vapour produced in the furnace was recovered in a condenser-filter unit connected behind the furnace. Based on slag analyses, the efficiency of extraction was found to be about 85 per cent. Analysis of the crude condensed magnesium indicated that a product of high purity (99.8 per cent) is attainable by thermal reduction in a plasma-arc furnace. Operation at atmospheric pressure has the advantage that the process can be adapted easily to semi-continuous or continuous operation, and that the vaporization of the relatively volatile manganese and silicon is suppressed. The levels of manganese and silicon in the crude magnesium produced were about 0.02 and 0.04 per cent respectively. The development of this process resulted in the installation of a 2 - 3 MW, semi-industrial scale, plasma furnace for magnesium production at Samancor's Metalloys plant. The silicothermic production of magnesium in a plasma furnace has been shown to be technically viable, (assuming the addition of an efficient condenser, such as an ISP-type splash condenser to the process). However, at present, there is no cost advantage over present electrolytic processes, so the work has been shelved by Samancor for the time being. Richards Bay Minerals (RBM) employs four rectangular six-in-line graphite-electrode furnaces for the smelting of ilmenite. Each furnace is 19 m long, 8 m wide, and has a power supply rated at 105 MVA (each pair of electrodes being supplied by a 35 MVA transformer). [22,23] Each of these three-phase open-arc furnaces is rated at 69 MW. The process technology, originally developed by Quebec Iron & Titanium (QIT Fer et Titane) of Sorel, Canada, was supplied to RBM in the mid-1970s, with the first furnace starting up in early 1978. The fourth furnace started up in mid-1991. The process has been adapted to smelt fine ilmenite obtained from a beach-sand deposit on the north-eastern coast of South Africa. A open-bath approach is employed, for which careful control is required to avoid erosion of the refractories of the side- and end-walls by the very reactive titania slag. The installed electrical capacity possibly makes these furnaces the largest scale AC transferred-arc plasma operation to date. RBM is currently the only South African producer of titania slag, and has an annual production capacity of some 2 Mt of ilmenite (FeO.TiO2) and 125 kt of rutile (TiO2). The ilmenite is smelted to produce about 1 Mt of slag and 550 kt of pig iron per annum. RBM's ilmenite is of too low a grade to be used directly for the production of pigment or synthetic rutile. Therefore, RBM followed the slag-beneficiation route, and currently produces about half of world titania slag output. Small-scale batch tests have been carried out in a 50 kW DC transferred-arc plasma furnace at Mintek and in a 40 kW water-cooled plasma furnace at the Mineral Resources Center of the University of Minnesota , to investigate the reduction of ilmenite to yield a high-grade titania slag and a pig iron by-product. The work was aimed at producing a slag suitable for use as a feedstock for the fluidized-bed production of titanium tetrachloride. The tests were conducted on three different ilmenite concentrates with widely differing chemical compositions and geological histories. The influence of parameters such as the particle size of the reducing agent, the amount of carbon addition, and the reaction time on the grade of the slag and the recoveries of titanium and iron were studied. The thermal balance of the furnace was carefully controlled to maintain a protective 'freeze lining' to ensure that the graphite crucible and titania slag did not react chemically. The electrical and physical characteristics of the DC transferred-arc plasma furnace were found to be well suited to the smelting of ilmenite. Stable furnace operation was observed during the processing of all three ilmenite concentrates, and slags containing more than 80 per cent titanium dioxide (by mass) were readily obtained. It should be mentioned here that work has also been carried out on the production of ferrotitanium in a DC transferred-arc plasma furnace. Several companies are investigating the possibility of developing new titanium projects in Southern Africa, including deposits in Natal, Transkei, and Mozambique. Of these, only Anglo American's Namakwa Sands project has been formally announced. This R1000 million (US $340 million) project on the Cape west coast was approved in November 1992. The project will comprise a mining operation near Brand-se-Baai, where heavy mineral concentrates will be produced. Production is scheduled to start in 1994, at an initial mining rate of 4 Mt of sand per annum. The full production rate is expected to reach 16 Mt/a. Reserves are in excess of 500 Mt. The concentrates will be transported by road to the Koekenaap plant where ilmenite, zircon, and rutile will be recovered. Zircon and rutile will be exported as high-purity concentrates, whilst the ilmenite will be smelted at a plant between Vredendal and Saldanha. In order to proceed with the project, Anglo American needed to develop a new process to smelt ilmenite, as the QIT/RBM process is held under licence. (The high electrical conductivity of titania slags and the accurate control of the slag composition effectively rule out the use of conventional submerged-arc technology for the smelting of ilmenite.) The corporation has successfully developed a process, in partnership with Mintek, based on single hollow-electrode plasma furnace technology. [26-28] The first of two furnaces is expected to come onstream during 1995. When the mine is at full production, the operation is expected to treat 1200 kt of primary concentrate per annum, to produce 195 kt of ilmenite slag, 120 kt of pig iron, 140 kt of zircon, and 38 kt of rutile. Semi-continuous production of calcium carbide (from lime or dehydrated calcium hydroxide) in a plasma furnace has been demonstrated on a pilot scale at Mintek, in DC transferred-arc plasma furnaces rated at 50 kVA, 200 kVA (operated at 140 kW), and 3.2 MVA (operated at 500 kW). Excellent agreement was obtained between the experimental results and the results of simulations carried out during a detailed thermodynamic study of the carbothermic production of calcium carbide at elevated temperatures. A maximum grade of 93 per cent CaC2 was achieved during batch tests, while grades above 80 per cent CaC2 (higher than those produced in industrial carbide operations) were realized during semi-continuous operation. The results of the work also suggest that the calcium units could be recirculated after acetylene generation. The high operating temperatures prevented the build-up of unwanted impurities in the carbide. The recirculation of the calcium units to the carbide-producing furnace would be a possible advantage of the plasma route. Pyrosim (Pyrosim) is a general-purpose computer program, developed at Mintek, for the steady-state simulation of pyrometallurgical processes. One of the primary strengths of the program is its built-in capability to calculate multicomponent multiphase equilibria, along with the automatic performance of energy-balance calculations. This predictive ability allows the program to simulate novel processes rather accurately. The program was originally developed for the purpose of simulating processes for the production of raw stainless steel. However, it has also been applied successfully to the processing of ferro-alloys, metal carbides, base metals, and refractory metals, as well as preheating, prereduction, and combustion processes. Models (empirical / phenomenological as well as predictive) have been developed for a number of process units and process steps, including a heater / drier, fluidized bed, and rotary kiln, as well as for electric-arc furnaces. Some of these models also provide a significant quantity of derived information, such as the liquidus temperature, viscosity, and basicity of slags, as well as gas ratios and degrees of reduction. Predictive modelling of plasma-arc furnaces has been particularly successful, as these furnaces often come close to allowing multi-reaction multi-phase equilibrium to be attained. Pyrosim has recently been used successfully to model the plasma-arc treatment of electric-arc furnace dust, a process that is inherently complex because of the number of chemical elements involved. Work is currently underway at Mintek towards the development of a computer program to model the dynamic behaviour of the bath of a plasma-arc smelting furnace. The techniques of computational fluid dynamics (two-dimensional, axisymmetric) are to be used to study the variation in temperature, fluid flow, voltage, current, phase changes, and chemical composition (in a multiphase reacting system) throughout the bath of the furnace. The variation of these quantities with time can then be studied to predict and add to the understanding of such aspects of the process as the position of the freeze-line in water-cooled furnaces, and the effects (on temperature and chemical composition of products) of introducing feed materials at different areas of the bath. This will allow side-feeding to be contrasted with centre-feeding. The control of an open-bath process is extremely critical, because of the ease with which unwanted reactions can become significant if a suitable temperature and feed distribution are not maintained. The reaction rate is rapid because small particles are used. The vapour loss from the hot zone of the furnace can be high because of the rapid and direct evolution of gases from the surface reaction layer, with little possibility that the vapour will condense on cooler, incoming solid material. A balance must be maintained between the feed rate and the power input to a plasma furnace, to ensure a relatively constant operating temperature. As a result of the short response time of the system, there is a need for a higher level of control than is currently required in the operation of a submerged-arc furnace. The short time-constants associated with the process emphasize the necessity for the feed of raw materials to be set at the correct rate, and for a wide range of other variables to be maintained and controlled. Stable metallurgical performance is obtained when there is an adequate level of control over the operation. The most important factor is the ratio of feed rate of raw materials to power input. This ratio is not a constant, and it has to be updated regularly as furnace conditions change. To control the feed rate effectively, a multiple-hopper system with a ramp feed-rate controller was designed and constructed at Mintek, and very accurate proportioning of the different feed materials was achieved at all times. In addition, it is important that feeding continues whenever the power is on. If an arc is maintained while no raw material is being fed, localized bath temperatures increase rapidly, damaging the refractories and causing unwanted side-reactions. The investigations into, and the development of, plasma-arc technologies for various applications in the metallurgical industry have resulted in several commercial successes in South Africa. (The authors are not aware of any plasma furnaces in Africa outside of South Africa.) The large-scale operations have all used graphite electrodes instead of water-cooled torches. The current trend has been to a single electrode operating with DC instead of AC, and at power levels of up to 30 MW. Ferro-alloy processes, in particular ferrochromium smelting and ferromanganese fines remelting, have been scaled up to industrial operation, but re-applications have been limited because the technology has been closely guarded. Further development work will be necessary if silicon, ferrosilicon, and ferromanganese alloys are to be smelted in plasma-arc furnaces, because the vapour species generated by the process cause unacceptable losses. Applications to refractory materials and light metals (e.g. magnesium) are being pursued, and a commercial project is being planned for ilmenite smelting using DC plasma-arc technology developed by Mintek. Because of its level of industrialization, South Africa has taken the lead in Africa in the development of plasma-arc technology. South African companies are well placed, therefore, to assist countries in the rest of Africa with the technology, under suitable commercial arrangements. This paper is published by permission of Mintek. Thanks are due to A.F.S. Schoukens and H. Lagendijk of Mintek, and W.F.A.T. Meihack of Genmin Process Research for their helpful discussions and comments. 1. Hamblyn S.M.L. Plasma technology and its application to extractive metallurgy, Miner. Sci. Eng., Vol.9, No.3, July 1977, pp. 151-176. 2. Stenkvist S.-E., and Bowman B. High-power, graphite-cathode DC arc plasma -- Properties and practical applications for steelmaking and ferroalloys processing, Plasma Technology in Metallurgical Processing, The Iron and Steel Society, AIME, 1987, Chapter 8B, pp. 103-109. 3. Curr T.R., Barcza N.A., Maske K.U., and Mooney J.F. The design and operation of transferred-arc plasma systems for pyrometallurgical applications, Proceedings of the 6th International Symposium on Plasma Chemistry, Boulos, M.I. and Munz, R.J. (eds. ), Montreal, Quebec, July 1983, Vol. 1, pp. 175-180. 4. Meihack W.F.A.T., Curr T.R., Barcza N.A., and Jones R.T. The effect of feed pretreatment on the efficiency of a plasma-arc furnace, Proceedings of the 8th International Symposium on Plasma Chemistry (ISPC-8), Tokyo, Japan, September 1987, Vol. 3, pp. 1892-1899. 5. Barcza N.A., Curr T.R., and Jones R.T. Metallurgy of open-bath plasma processes, Pure & Appl. Chem., Vol.62, No.9, 1990, pp. 1761-1772. 6. Barcza N.A., Curr T.R., and Maske K.U. The application of thermal plasma technology to large-scale pyrometallurgical processes, Extraction Metallurgy '85, Institute of Mining and Metallurgy, London, June 1985, pp. 709-740. 7. Barcza N.A. The development of large-scale thermal-plasma systems, J. S.Afr. Inst. Min. Metall., Vol.86, No.8, August 1986, pp. 317-333. 8. De Beer J.A. Atomic Energy Corporation of South Africa Ltd, Personal communication, November 1992. 9. Bester J.A., De Beer J.A., and Rohwer H.E. Metallic zirconium production by hydrogen reduction of ZrCl4 in a transferred arc torch, Second European Congress on Thermal Plasma Processes, Paris, 7-9 September 1992, 8 pages. 10. Cousins C.L. Anglovaal Ltd, Personal communication, November 1992. 11. Anonymous. Usco: Seeking salvation in direct reduction, Met. Bull. Month., May 1984, pp. 28,31. 12. Blom P.W.E. Potchefstroom University (previously at Union Steel Corporation of South Africa Ltd), Personal communication, November 1992. 13. McRae L.B., Barcza N.A., and Curr T.R. The application of transferred-arc plasma to the melting of metal fines, Mintek 50. Proceedings of the International Conference on Mineral Science and Technology, Haughton L.F. (ed. ), Randburg, Council for Mineral technology, 1985, Vol. 2, pp. 827-836. 14. Strohmeier B. and Bachmayer J. Melting of kiln-based DRI in large UHP-arc furnaces at Iscor Ltd, Paper presented at the 5th SL/RN Kiln Operators' Conference, Vanderbijlpark, South Africa, 21 - 24 April 1985, 20 pp. 15. Schoukens A.F.S., Nelson L.R., and Barcza N.A. Plasma-arc treatment of steel-plant dust and zinc-containing slag -- theoretical and practical considerations, Recycling Lead and Zinc. The Challenge of the 1990's, International Lead and Zinc Study Group, London, 1991, pp. 361-370. 16. Slatter D., Barcza N.A., Curr T.R., Maske K.U., and McRae L.B. Technology for the production of new grades and types of ferro-alloys using thermal plasma, INFACON 86, Proceedings of the 4th International Ferro-alloys Congress, Finardi J., Nascimento J.A., and Homem de Melo F.D. (eds. ), Sao Paulo, Brazil, Associacao Brasileira dos Produitores de Ferro-Ligas--Abrafe, 1986, pp. 191-204. 17. Anonymous. A world first -- the DC plasma arc furnace, SA Mech. Eng., Vol.39, May 1989, pp. 223-229. 18. Hütter U. Refractories and conductive bottom design for DC-arc furnaces, system ABB, Radex-Rundschau, 1992, Vol.2/3, pp. 83-95. 19. Schoukens A.F.S., and Curr T.R. The production of manganese ferro-alloys in transferred-arc plasma systems, 42nd Electric Furnace Conference Proceedings, Warrendale, The Iron and Steel Society, AIME, 1985, pp. 161-171. 20. Müller H.G., Koch E., Dosaj V.D., and Wellbeloved D. Examples of plasma potential for industrial application, ISPC-9 Workshop on industrial plasma applications, Volume 2 -- Thermal Plasma, Pugnochiuso, Italy, 9-10 September 1989, pp. 50-59. 21. Schoukens A.F.S. A plasma-arc process for the production of magnesium, Extraction Metallurgy '89, London, The Institution of Mining and Metallurgy, 1989, pp. 209-223. 22. MacPherson, R.D., Mineral processing at Richards Bay Minerals, Proceedings of the 12th CMMI Congress, Glen, H.W. (ed. ), Johannesburg, The South African Institute of Mining and Metallurgy, 1982, Vol. 2, pp. 835-840. 23. Skillen A. Mineral sands, Crash of the Ti-tans, Ind. Min., August 1992, pp. 19-33. 24. Brent A.D. The smelting of ilmenite in a d.c. transferred-arc plasma furnace with a molten anode configuration, Report No. M304, Randburg, Mintek, 15 July 1987. 25. Brent A.D., McRae L.B., and Lagendijk H. The production of ferrotitanium in a DC transferred-arc plasma furnace, Proceedings of the 5th International Iron and Steel Congress, Washington D.C., April 1986. 26. Robinson I. SA's developing titanium industry, Engineering News - Mining, 25 September 1992. 27. Tommey D. R1-bn shot in arm for Cape west coast, The Star, Johannesburg, 20 November 1992, p.18. 28. Valentine S. Anglo American gaan voort met sy Namakwa Sands-projek, Beeld, Johannesburg, 20 November 1992, p.S1. 29. Erasmus L.J. The application of plasma-arc technology for the production of calcium carbide, 49th Electric Furnace Conference Proceedings, Toronto, The Iron and Steel Society, AIME, November 1991, pp. 293-298. 30. Jones R.T. Computer simulation of pyrometallurgical processes, APCOM 87, Proceedings of the Twentieth International Symposium on the Application of Mathematics and Computers in the Minerals Industries, Volume 2: Metallurgy, Johannesburg, The South African Institute of Mining and Metallurgy, October 1987, pp. 265-279. Originally published as Plasma Developments in Africa, Second International Plasma Symposium: World progress in plasma applications, organized by the CMP (Center for Materials Production) of EPRI (Electric Power Research Institute), 9-11 February 1993, Palo Alto, California. Also presented as Plasma technology in Africa at the Colloquium on Mining and Metallurgy, South African Institute of Mining and Metallurgy, Vanderbijlpark, 10-11 May 1993.